Mrs Karen Newis, already a generous donor, hosts coffee and cakes – to raise awareness and funds for one of our Girl Sponsorship Programmes. 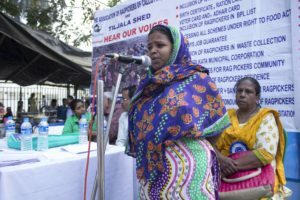 On 19th December 2017 1000 rag pickers and their supporters marched peacefully from Ramlila Park to Esplanade to assert their rights. Rag pickers keep the city clean and even sort the rubbish ready for recycling. This is respectful of the environment and yet the rag pickers are deprived of their rights. 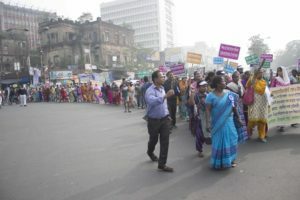 Among the marchers were representatives from the ARP (Association of Rag Pickers – the organisation set up and facilitated by Tiljala SHED), members of the rag picking community, NGO leaders and journalists. Participating NGOs were Disha, Tiljala SHED and Kolkata Samaritans. Among the speakers were Mr Bhanu Raj, who opened with a song. He stressed the importance of belonging to a movement to fight for one’s rights. TSHED’s Md Alamgir reminded the crowd that after last year’s rally, rag picking was recognised as a profession. He thanked the government for this and hoped that this year’s rally would yield more positive results. Mr Sashanko Deb from Disha pointed out that rag pickers’ contribution to the environment has been recognised in 22 modern cities of India and by other developed countries. 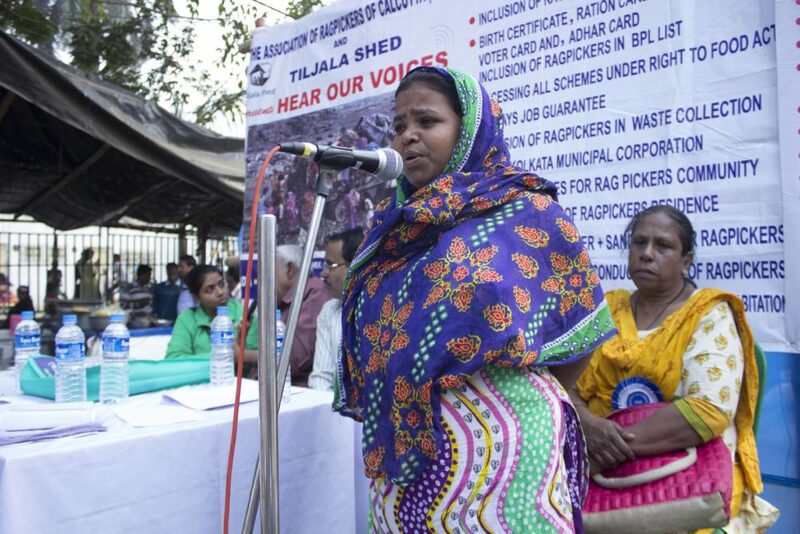 Among the speakers from the rag picker community itself was Monowara, the ARP secretary. She pointed out that poverty prevents some rag pickers from enrolling their children in school. Aleya Bibi remarked that some children are locked into their shelters and left alone whilst their parents go out rag picking. She also mentioned that they have no toilets or proper sanitation. The following demands were presented to Mrs Sashi Panja, representing the Ministry for Women, Children and Social Welfare. Recognize Rag Pickers as unorganized labour force under SASPFUW (State Assisted Scheme of Provident Fund for Unrecognized Workers). Rag picking should be included in the list of recognized occupations. Legalize the actual address where they reside even if it is on a government property like canal side, railways or under the flyover. Scope for removal of recyclable waste materials before the waste is dumped into the Garbage Compactors. Ensure segregation of waste before being dumped into the compactors. (Compactors have adversely affected the income of rag pickers). They should be involved in door to door collection and work under Kolkata Municipal Corporation. 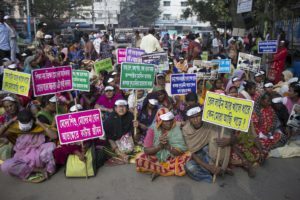 Demand at least 100 days work or job as cleaners related to segregated waste removal for the rag pickers under Kolkata Municipal Corporation. Demand housing, water and sanitation for the rag picker families living along the railway squatters, canal side, pavements and under the flyovers. Rag pickers should be eligible for all government welfare schemes such as widow aid, old age pension, Janani Suraksha Yojana, Kanyasree, etc. Request the Government to conduct a survey to identify the number of rag pickers in West Bengal. Setting up crèche in all areas where the rag pickers reside for care and protection of their children. Improve the working condition of those working in the Dhapa Dumping Ground and other dumping sites across West Bengal. Accessing all schemes under the 19 schemes under “Right to Food Act”. We hope that we will continue working together for issues which affect the lives of the less privileged community people.